Leading passive house design firm Architype built a name for itself in the education sector with the design of timber frame passive house schools in Wolverhampton. Two of these schools — Oak Meadow and Wilkinson — were previously profiled by Passive House Plus. Both projects featured super-insulated, airtight timber frame structures made in Cork by Irish manufacturer Cygnum. For these new buildings at Burry Port Community School, design was a collaborative process between Architype and architects at Carmarthenshire County Council. The plan was to construct two buildings, each with an ambitious goal of its own. The new school building — to include four classrooms, other teaching spaces, plus staff and meeting rooms — would be built with a conventional timber frame system but meet the passive house standard. The second curved ‘pod’ building — which would house performance and recreation spaces — would use an innovative and ecological timber frame method known as brettstapel. It would be built to basically the same spec, but without the specific goal of reaching passive house. The old school building would also undergo refit, which was largely cosmetic. At an early stage, the project received funding from the timber industry group Wood Knowledge Wales (WKW) to explore the possibility of using low grade Welsh softwood for both structure and cladding. The project would offer “a visual demonstration of the capability and affordability of this low grade timber,” Andrew Tidy says, as well as being aesthetically beautiful. The design team worked closely with wood scientists from WKW. “Welsh timber was at the heart of this project. Our wider goal was to help support and promote the use of Welsh materials and encourage growth and opportunity with the timber industry in Wales.” This goes hand-in-hand with the council’s responsibility to deliver “community benefits” through its building projects, which are 50% funded by the Welsh Assembly government, he added. Specifying brettstapel for the Pod building would be highly ecological too. “Brettstapel is a method of solid timber construction using low grade timber that would otherwise end up in pallets, woodchip or fence posts,” project architect George Mikurcik of Architype says. Timber studs are stacked into panels which are held together with hardwood dowels — no nails or glues are used. The panel itself is the final finish, there are no internal linings. For the Pod building, the brettstapel panels were fitted on the outside with 300mm Larsen trusses, which were fully insulated with Warmcel blown cellulose insulation. (Above and below) The brettstapel system, an ecological method of solid-timber construction that utilises low grade timber held together with hardwood dowels, was used to form the curved walls of the Pod building, which will house the school’s performance and recreational spaces. The brettstapel system was manufactured in Ireland by Cygnum, using Welsh softwood. George Mikurcik says that taking a fabric-first approach with brettstapel was relatively straightforward once the team adopted a clear airtightness strategy. An 18mm layer of OSB applied to the outside of the panels was installed prior to the installation of the Larsen truss insulation zone, and serves as an airtightness and racking layer. Though it wasn’t built to passive house, the brettstapel building was constructed to a very similar spec as the passive house certified, timber frame school, though no airtightness test or PHPP analysis was done on the Pod building. The passive house school building, also known as the KS2 building, has timber frame walls featuring 400mm deep timber I-beams, insulated with Warmcel, while the roof has a similar structure with a zinc finish externally. 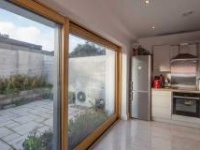 “The biggest challenges in meeting the passive house standard were slightly unfavourable form factor — lots of double height spaces in the KS2 building — and a relatively large number of external doors, which can be tricky in terms of airtightness,” George says. The ground floor of both buildings features an insulated slab foundation system, while IFT Rosenheim certified windows from Internorm feature throughout. 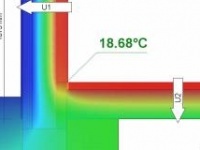 The heating and ventilation design was kept as simple as possible for both buildings. Architype had learned from their previous passive house schools that overly sophisticated setups — building management systems, automated windows and the like — can be problematic in schools, where staff just want simple controls. (clockwise from top left) The main timber frame KS2 building at Burry Port, seen here with Hunton Sarket T&G sheathing board; before larch cladding was installed over the timber battens; Swegon Gold MVHR ystem delivered to site with architect Hannah Dixon from Architype; the curved walls of the brettstapel pod building; the stapled and sealed 18mm OSB on the inside forms the airtightness layer. “Space heating has become a really non-critical issue in passive house schools,” says Alan Clarke of passive house consultancy Elemental Solutions, who advised on the heating and ventilation. Low space heating demand enables simple, minimal heating solutions — in this case, a single domestic condensing gas boiler in each building, delivering hot water to radiators, which are controlled by thermostatic radiator valves. “We have found this quick response system is suitable for the school environment where a quick warm-up is needed before the start of the teaching day,” George Mikurcik says. “You can dump all the fancy controls,” Alan Clarke adds. “The people who run primary schools from day-to-day are not facilities managers.” In the Pod building the gas boiler also provides hot water, while in the passive school building decentralised electric water heaters do the job. Some of Architype’s previous passive house schools featured building management systems that shut down the MVHR (mechanical ventilation with heat recovery) in summer, switching over to automated natural ventilation via the windows, and extract fans in the bathrooms. But Alan Clarke says this was overly complex. At Burry Port, the team ditched the BMS and let the MVHR run all year around, with a summer bypass mode kicking in automatically when needed. One advantage of letting the MVHR run all year is that you can give occupants back total control over opening and closing windows — you don’t need to worry about air quality suffering if occupants forget to open them. “As we’ve got the MVHR ticking along in the background, we can say open the windows if you want, or don’t open them,” Alan says. In addition to the MVHR, the passive house school building has a simple strategy for manual ventilation, with handle-controlled vents at low level in the classroom and upgrade actuator-operated windows higher up — the latter linked to simple on/off switches, with no automation. This simple system also avoids the capital and service cost to the school of a BMS. But apart from energy and ventilation, what were the team’s design goals? For one, to make the old and new school buildings work together, creating a secure courtyard in between. There was also an emphasis on simple materials — the untreated larch cladding, zinc roofs, low VOC materials and finishes inside. The aim, architect George Mikurcik says, was to create a vibrant and healthy teaching environment. “We have paid particular attention to acoustic design in order to create calm and comfortable spaces,” he says. As with several previous Architype projects featured in Passive House Plus, the ceiling finishes included Troldtekt acoustic panels – a cement-bonded wood product with numerous health and environmental certifications. Architype’s consideration for sustainability starts from the ground up – including the ground floor finishes, which variously consisted of 100% biodegradable Marmoleum flooring from Forbo, which includes a mix of renewable natural materials and recycled content; Noraplan Ultra Grip rubber flooring, which is manufactured to strict ecological criteria; Paragon carpet tiles with 65% recycled materials & BRE Environmental ratings of A/A+ and a resin seal on the concrete floor slab. Further awards are possible too: the project has been shortlisted for the National Eisteddfod of Wales’ Gold Medal for Architecture. 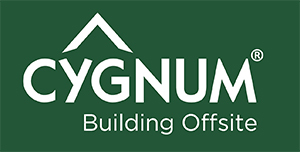 Main contractor WRW has also been shortlisted for the Constructing Excellence in Wales Sustainability Award for the project, while Architype and Cygnum have been shortlisted for the educational building award at the Structural Timber Awards for the project. The school has now occupied the new buildings for a year, though data from the first year of monitoring wasn’t yet available at the time of going to print. But Andrew Tidy says feedback has been hugely positive. “The simple operation of the new buildings, minus a BMS, as well as the comfort benefits, have both been highly commended as a resounding success,” he says. 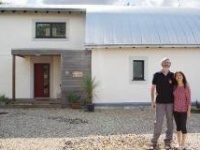 But he does think building to the passive house standard added something to the cost. He adds, however, that it’s difficult to gauge how much of this was down to lack of experience and market confidence — both of which should be temporary factors — and how much is down to more permanent costs, like passive house design. “This is still a relatively niche market in Wales,” he says. Because this was a complicated project, with a refurbishment element and two new buildings — only one of which was passive — it’s not easy to tease out the extra cost of meeting the standard. Andrew estimates the passive building may have cost between 8% and 10% more than other new build schools in the area. But he says that given the complexities of the project, and the use of an innovative structural method, it’s not the best basis for a comparison. The council’s next passive house projects may reveal more. 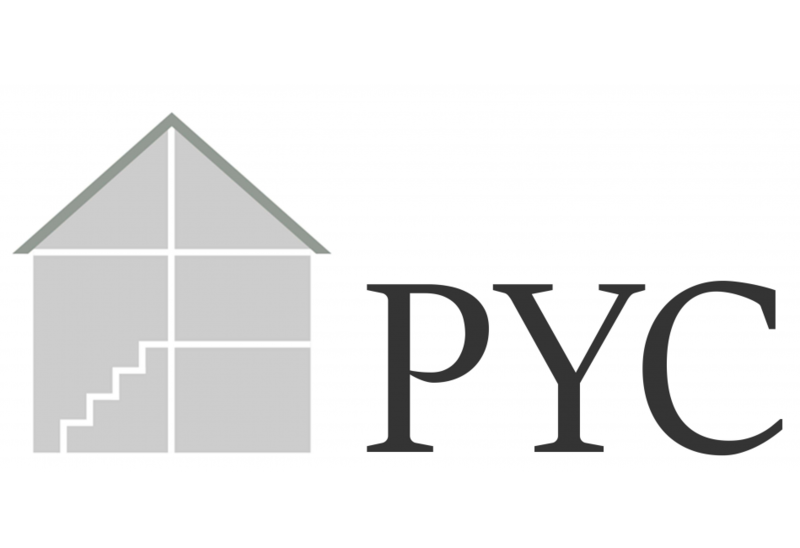 Carmarthenshire County Council has committed to building two more passive house schools, one of which has recently started on site. Andrew says that given the success of Burry Port, the council may look to adopt a more formal passive house policy, but it isn’t quite at that stage yet. 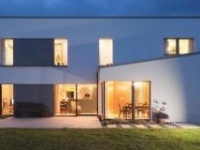 The local authority is, however, planning to train some of its staff to become passive house designers. The parents of a child suffering from chronic asthma told the school of a tangible improvement in their child’s lung function since moving into the new building. “I also feel we have captured the imagination of the children,” he says, through “introducing practical and creative lessons in recycling and natural materials through immersing the workspaces with tactile and thought provoking design.” This includes the use of recycled tyres, cellulose insulation, the larch cladding, and so on. Ventilation: Swegon Gold passive house certified MVHR units to both buildings, passive house certified heat recovery efficiency of 84%.